Save time and money with Jayhawk’s Email Billing Module! Are you wanting to be more environmentally friendly and reduce paper usage? Are you tired of the time it takes to print bills, tear apart bill cards, or stuff statements in envelopes? Are you wanting to cut expenses by spending less on billing cards, paper or envelopes? 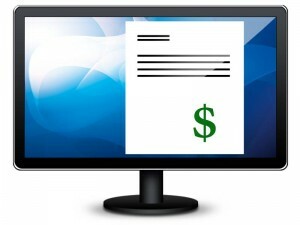 Are your customers asking you to send their bills by email rather than on paper? If you can answer yes to any of these questions, then it’s time to consider our email billing module! Jayhawk Email billing gives you the option to send bills and/or past due notices to selected customer accounts via e-mail. You have the flexibility to email an individual bill or all bills together. Any customer accounts not selected for email billing will print on a bill card or paper statement. On each customer account you can mark whether the customer is to receive their bill via email only, printed card/statement only, or both. For more information on whether email billing is a suitable solution for your city or district, here are Additional Details you will want to consider. Contact us today for a quote or for more information!